Rancho Cucamonga, CA - The Lancaster JetHawks exploded for ten runs in the seventh inning, turning a five-run deficit into a five-run lead, beating the Rancho Cucamonga Quakes on Saturday night by a score of 12-7, securing a berth in the California League Championship Series. Brendan Rodgers' two-run infield hit gave the JetHawks a lead they wouldn't surrender, as Lancaster won the series, three games to one, and will open up the Championship Series on Tuesday at the Hangar, hosting the Modesto Nuts in the best-of-five. Yonathan Daza had four hits and four RBIs, while the JetHawks put up a total of 14 hits on the night. 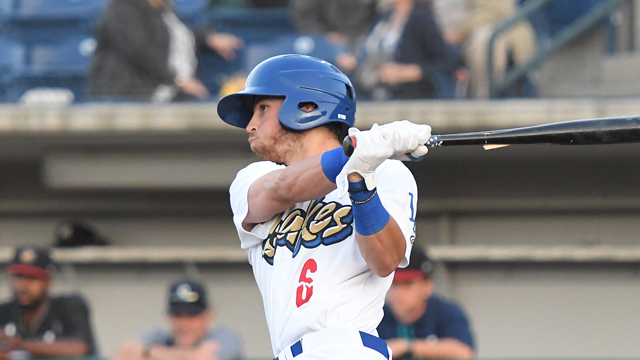 DJ Peters, the Cal League MVP, capped a four-run third with a two-run double, helping the Quakes establish an early 4-0 lead. Quakes' starter Dustin May was sharp through the first three innings, facing the minimum. But after allowing a run in the fourth, May was removed with an apparent arm injury after giving up a lead-off double in the fifth. The JetHawks pushed across a run to make it 4-2, as Andrew Istler came out of the bullpen and issued a bases-loaded walk. Rancho opened it up with three in the sixth, highlighted by Brandon Montgomery's two-run single, as the Quakes made it a 7-2 lead. Lancaster put together a memorable rally against Dodgers' rehabber Scott Kazmir, along with Quakes' relievers Jason Richman (1-1) and Tony Gonsolin, scoring ten times while sending 14 men to the plate. Lancaster reliever Brad Schreiber (1-0) retired all five hitters he faced to earn the win, while Marc Magliaro set down all five hitters he faced to finish it off. THE QUAKES WOULD LIKE TO THANK ALL THEIR FANS for all their support here in 2017. Thanks for making it out to LoanMart Field and we hope to see you again in 2018. Fans are encouraged to stop by the Quakes' offices in the coming weeks, as 2018 preview schedules are now available. Thanks again for a great year. GO QUAKES!